Planetary Intelligence: 101 Easy Steps to Energy, Well-Being, and Natural Insight. In July, 2006, our "Team Cosmos", which included Simeon Hein, Peter Sorensen plus others, made the Mathamagical Matrix Crop Circle for Scott Flansburg of HumanCalculator.com and sponsored by the non-profit Institute for Resonance. The Math Matrix is created around a base-9 number system, rather than the base-10 system we are commonly taught in school. Scott, a spokesman for Qwest in Denver, teaches school kids how to add numbers in their heads using this system. The formation took us two days to complete with a total of eight American and British circle-makers working in the daytime. The formation showed evidence of strong electrostatic displacement compared to the surrounding fields. 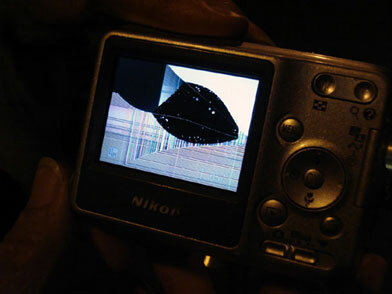 There were a couple of instances of battery and camera failure in and above of the formation during overhead photography flights. Read more from our project coordinator Peter Sorensen. We constructed this formation at the Iris Test Center which is owned by Jim and Janet Leifer in St. John, Washington. The formation was made in wheat by 4 people, including the farmer, who can be seen in the first and third photos below handling the "stalk stomper" board. It took us about 15 minutes in very hot weather, about 99 degrees Fahrenheit. We measured 20 to 30 volt changes with our Trek electrostatic meter inside the formation which is typical of many crop formations, manmade or otherwise. The photos below show the Institute for Resonance experimental circle from August 2003 in England. The first photo shows our "waveguide" formation from the air. The 100 foot diameter formation took about 3 hours to complete with five people, most of whom were "beginners." The two photos below, that were taken the next day, show the bent nodes that were produced in the same circle following the construction of the formation. This shows that bent nodes are the result of the plant trying to straighten itself after being flattened by the "stomper board." In June, 2002, we made a small crop circle in the midwest United States to scientifically test the effects of the circle on our research equipment, including our Trek-520 static electricity meter. The circle was about 12 feet in diameter and took about 5 minutes to construct using a stalk-stomping board. We found that the circle changed the static meter by over 2500 volts compared to readings in the rest of the wheat field. When the slides of the film were developed several months later we found strange light anomalies on many of the slides. Pictures taken of other locations on the same roll of film were not effected. This incident supports the idea that manmade formations create paranormal effects. If you have any explanations of your own please lets us know using the email link at the bottom of the Opening Minds page. The formations below were made by Matt William's circlemaking team for a Japanese TV show on crop circles. Williams gave the TV crew 20 formations to choose and they chose the design below. The first photo shows this formation which took 3 hours to make at night. 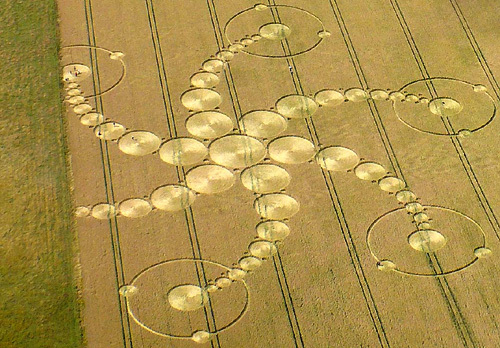 It was modelled on a crop formation made by an unknown artist that appeared in 1999 in Allington, England, seen in the third and fourth photos. The scaffolding for the TV cameras can be seen behind the formation next to the road. The insectoid-looking formation in the second photo was made at the same location in about 2 hours at night. This formation was made by the Matt Williams circlemaking team for a British movie. The formation took about 6 hours to construct at night. 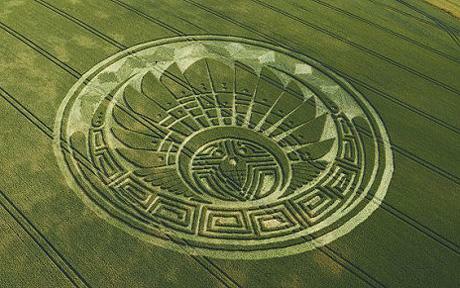 The formation was a replica of a crop circle that appeared in Hampshire, U.K. in 1995. 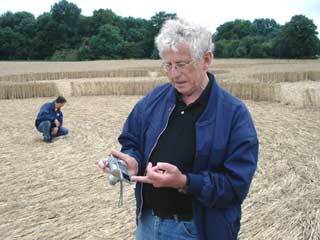 In July, 2001, we made several crop circles in the Hilmarton area of England. The largest circle took about 6 hours to make during night and part of the following day. We were beginners and were not trying to set any speed records. The first photo on the left shows the large formation before completion. The photo on the right shows the finished formation the next day. Two of the people who helped us make the formation were seventy-year old women. The experiment showed us that people can make the big formations. The large formation below is 300 feet in diameter. This formation below was made according to researcher Masao Maki's specifications to test whether human circlemakers could make a complex design. The pattern is based on the logo for his restaurant seen below. The formation was constructed in three hours at night by Matthew Williams and his associates with the permission of the farmer. This formation below was made at night by seven human circlemakers with only three "stomper" boards. I witnessed the entire event which took a total of about 5 hours. 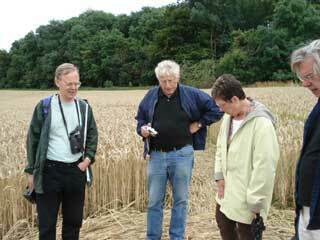 The crop is young barley and some of the circlemakers were beginners. The picture on the left below was the black and white pattern I was shown ahead of time. The circlemakers had spent days designing the pattern. The finished formation is shown as the second photo. The last photo is an actual nightshot of one of the circlemakers constructing the formation. I did not participate in the construction of the formation which occurred near the town of Cherhill in England. This formation was made by a very talented circle artist and his team. I saw three different devices affected by this formation, within minutes of walking into it. 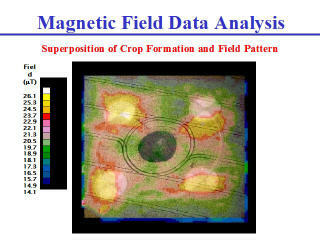 The crop circle affected electronic equipment for weeks. 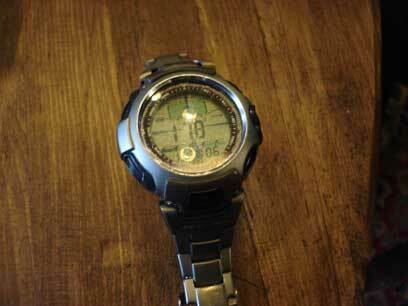 Below are pictures of GPS batteries that were instantly drained by the formation. The circlemaker who made the formation does not know why the formation has this effect. Some of the above pictures are contained in Opening Minds: A Journey of Extraordinary Encounters, Crop Circles, and Resonance.